From the endless beautiful beaches of the Caribbean, snorkeling in Caribbean Reefs, sightseeing on every island along the way, safari adventures through the jungles of the Caribbean, and remarkable duty-free shopping at every stop along the way, there is never a dull moment on any Caribbean Cruise! Below are destinations as well as adventures that each destination has to offer! Visit the luxurious Bahamian resort, Atlantis in Paradise Island. Interact with amazing dolphins at Atlantis Dolphin Cay, one of the largest dolphin habitats in the world. Register for the Aquaventure program, the premier water park in the Caribbean, and participate on a Discover Atlantis Tour. View more than 50,000 fascinating species of marine life in the largest open-air aquarium in the world. Take advantage of your once-in-a-lifetime opportunity to get up close and personal with a dolphin. Have your picture taken while kissing these loving creatures, learn about their anatomy, and pet and feed them while standing in waist-deep water. All at the wonderful facility that is home to Universal Studios’ Flipper, who starred in the 1996 movie with the same name. The Bahamian dollar (BSD) is the official unit of currency. U.S. dollars, traveler’s checks and credit cards are widely accepted. Cruise along Nassau on a glass-bottom-boat tour for a glimpse into the underwater world of the Bahamas. What is more relaxing than taking a break from life on your own semi-private island? Nothing. Located just a short boat ride away from Nassau, Blackbeard’s Cay is surrounded by crystal-clear turquoise water, sandy beaches and swaying palm trees. Visit Predator Lagoon (if you dare!) where you’ll see sharks, barracuda and many other creatures from the deep. Be careful not to fall in! With dormant volcanoes, golden sand beaches and gorgeous green hills, St. Kitts is a beautiful backdrop to your Caribbean adventure. Discovered in 1623 by the British and settled by the French in 1625, the island’s deep colonial history is reflected in the abandoned fortresses, as well as its landscaped gardens, city squares and architectural details. If you’re looking for a wide range of island flavor, St. Kitts is for you. Chances are you’ll come across all sorts of culinary delights stemming from West Indian, Creole, Indian, and French cultures. Typical dishes include roast suckling pig, shellfish and a variety of locally grown produce such as yams, breadfruit and papaya. The official currency is the Eastern Caribbean dollar (XCD). U.S. dollars, credit cards and traveler’s checks are widely accepted. Walk through Independence Square. Now a small public park, it was built in 1790 for slave auctions and council meetings. Visit St. George’s Cathedral. While originally christened Notre Dame in 1670 by the French, it was destroyed more than once and was most recently rebuilt in 1869 in typical Georgian style. With this island’s dormant volcanoes and rugged mountains, hiking is a popular activity. And of course with turquoise-blue Caribbean waters, you can spend the day snorkeling, swimming or fishing. With miles of lush tropical rain forest, a gorgeous Caribbean coastline and the longest barrier reef in the Western Hemisphere, it doesn’t take long to realize why Belize City is known as “The Jewel.” Located between Mexico and Guatemala, Belize possesses a unique combination of modernity and rustic Caribbean charm. Ancient ruins indicate that Belize was first inhabited by the Mayans in 300 B.C. This Indian heritage, combined with a rich European history, creates a destination full of charm and wonder for all to discover. Climb to the top of El Castillo, a 135-foot structure created by the Myans. From the top, you can see the lush rainforest of Peten, the Mayan Mountains and even across the border into Guatemala. Keep your eyes open for flocks of toucans and parrots in the trees below you. The official currency of Belize is the Belizean dollar (BZD). Many stores and restaurants also accept major credit cards, which usually offer you a good exchange rate. The Baboon Sanctuary, Belize Zoo and Old Belize River are great places to witness some of Belize’s wildlife. Take a scuba diving shore excursion and explore Belize’s exciting underwater world and take in its unique coral structures, intricate caves and extensive marine life. Stroll the marketplace in Belize City and mingle with the local vendors selling fruits, vegetables, and arts and crafts. Shopping is the main thing that sets St. Thomas apart from the rest of the Caribbean! While the beaches and ocean are beautiful, the shopping is remarkable. Browse through the shop-lined streets of Charlotte Amalie and find out why St. Thomas is called the “duty-free shopping capital of the world.” There are over 400 shops along the Main Street area in Charlotte Amalie and some 50 more in Havensight Mall. You will find bargains on everything from liquor to imported china and crystal. Visitors can bring home $1,200 in merchandise without paying duty – twice the limit of most of the Caribbean. Take a ride on Skyline Drive and enjoy a breathtaking view of St. Thomas Harbor. Then travel to Mountain Top, the highest point on St. Thomas, and see spectacular views of Magens Bay, one of the most beautiful beaches in the world. The U.S. dollar (USD) is the official currency. Traveler’s checks and credit cards are also widely accepted. Sit back and enjoy a relaxing half-day sail to Buck Island aboard a large sailing yacht, then snorkel in Turtle Cove. Spend the other half of the day lounging on the beach with a cold drink in hand! Book a shore excursion to travel 700 feet above the sea via skyride to The Paradise Point and see the most fantastic vistas in the Caribbean. Feeling athletic? Rent a bike and bike through Water Island or rent a paddleboard and paddle across the beautiful crystal clear blue Caribbean waters! For the ultimate day of fun-in-the-sun Barbados-style, cruise on the MV Harbour to a spectacular sandy beach. Snorkel or scuba dive on reefs packed with tropical fish. Enjoy the rope swing, sun tanning or walking on the beach. Barbados’ convenient location and friendly natives make it a true shoppers’ paradise and it is also Duty-free! Find competitive prices on diamonds, emeralds, sapphires, rubies and designer jewelry and watches including pieces from Chopard, Honora, John Atencio, John Hardy, Kabana, La Nouvelle Bague, Starnight, Cartier, Concord, Maurice Lacroix, Michele Watches and Movado. World-renowned Barbadian rum and delicious local rum cakes are also excellent buys. Shop until you drop! The Barbados dollar (BBD) is the official currency. U.S. dollars, traveler’s checks and credit cards are widely accepted. Rent a Land Rover® when you get to Barbados and take off on a self designed adventure! Visit places inaccessible by tour bus, such as Gun Hill Signal Station, and go off-road through Joe’s River Tropical Rain Forest. Surround yourself with beautiful coral and exotic marine life as you take a snorkel adventure through the Caribbean waters. Enjoy breathtaking panoramic views and learn about island culture and history on a comprehensive island tour of Barbados. Cozumel has become one of the world’s best duty-free shopping ports. Cozumel offers unbelievable prices on diamonds, colored gemstones, jewelry, watches, gold, sterling silver, and even Oriental rugs as well as Mexican housewares and handicrafts. Mexico’s currency is the peso (MXN). The $ sign is used to refer to pesos, so don’t be shocked at the price tags. Any prices in U.S. dollars are listed as US$ or USD. Many hotels, restaurants and shops also accept major credit cards, which usually offer you a good exchange rate. Escape to the secluded beauty of your own private beach paradise, Passion Island. Or any beautiful beach in Mexico for that matter, and relax – you’re on vacation! Jump in the Atlantis Submarine and explore the underwater world of Chankanaab on a deep sea adventure of a lifetime! Swim, Kiss and play with Dolphins at Chankanaab National Marine Park. Bring your sense of adventure, your camera, and your smile. These Dolphins are friendly creatures! Rent a Jeep® and take a safari adventure through the tropical landscape of Cozumel’s east side. Ride through sand dunes and trails for an unforgettable experience. Experience the ancient Mayan City of Chacchoben. This Mayan site dates back to 360 A.D. when it played an important role in the distribution of such precious items as wood, jade and exotic birds. Check out the Mayan Pavilion Park, which has everything: Mayan handicraft centers, swim-up bars, great traditional restaurants, saltwater pools, a 650-seat amphitheater, Mayan art and architecture, amazing water sports and great shopping. For more adventures, explore the many surrounding Mayan cities like Chacchoben, Kohunlich and Dzibanche. Sit back, relax and soak up the sun at Uvero Beach, complete with beach chairs, bar, restaurant, paddle boats, snorkeling and so much more. There is something to do for every member of the family! Travel through the jungle. Then relax on the beach with a cold drink while you enjoy the beautiful surroundings and warm ocean water! Interested in a designer watch or some find silver jewelry? Stop by the shopping plazas on your way back to the cruise ship! While in Panama, be sure to pay a visit to the impressive Gatun Locks, where you can watch ships and tankers being lifted up 85 feet to the level of Lake Gatun. Be sure to bring your camera – you’ll want to capture the amazing views that surround this engineering marvel. Also, be sure to check out Portobelo National Park. This charming bayside village is home to 16th- and 17th-century Spanish forts, ruins and treasure houses. Observe Panama’s outstanding site seeing and whilelife! You don’t want to miss out on the hot and spicy local cooking. And remember, you’re in a prime spot for fresh seafood, so take advantage. The official currency of Panama is the U.S. dollar (USD), known as the Balboa. Many stores and restaurants also accept major credit cards, which usually offer you a good exchange rate. 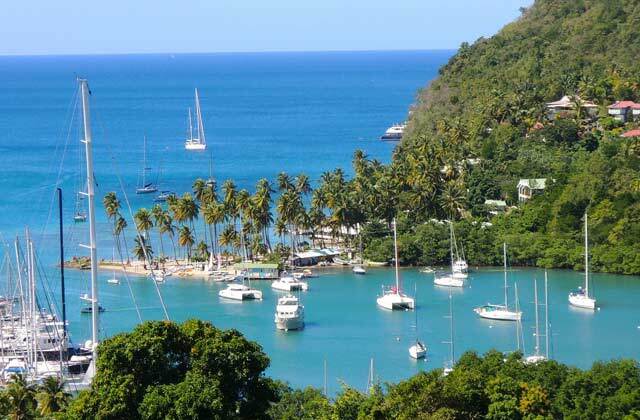 See the beautiful coastline of St. Lucia from the deck of a catamaran. You’ll have an unbeatable view of the scenery and get an exhilarating ride, too. Take a tour of St. Lucia’s green mountains, banana valleys, rain forests, fishing villages and the town of Soufrière. Drive by bus through Castries, Cul de Sac, the Roseau banana plantations, and the fishing villages of Anse-La-Raye and Canaries. Then board a boat for a relaxing ride back down the scenic coastline to Anse Cochon for swimming in beautiful crystal-clear waters. Hike Soufrière, home of St. Lucia’s most famous landmark, the towering Pitons, a set of primeval twin peaks topping 2,000 feet. Then take a relaxing dip in one of the warm sulfuric pools full of special nutrients. Also, like Barbados, you can shop duty-free until you drop!